Head Lice is a common issue that affects people of all ages. When an infestation occurs, it can easily spread to friends, other family members, classmates, etc. That’s why it’s so important to get rid of it as quickly as possible. However, this may be a daunting task for families who have never dealt with lice, are unsure what to look for, or simply don’t have the time or patience it takes to get rid of them on their own. A new treatment is helping families save time and frustration by getting rid of the lice in as little as 90 minutes. Lice Clinics of Canada, located at 907 Frederick Street in Kitchener, opened in October 2017 and has helped thousands of families since. The clinic uses an all-natural, patented, Health Canada-cleared medical device. The AirAllé device is so effective that it’s recommended by pediatricians and has now become a preferred choice of treatment for families. Most people aren’t aware that traditional drug store products are not as effective as they used to be. The toxic pesticides in these treatments have been used for decades, and lice have become pesticide-resistant. These days, lice are much tougher to treat and get rid of once and for all. In addition, if treating at home, it’s important to remove every nit from the hair, otherwise infestation will begin again in about two weeks time. 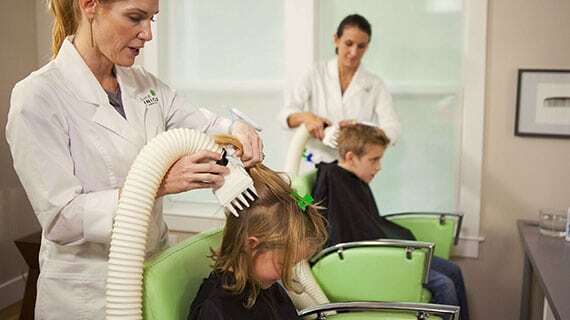 The Lice Clinics network has performed more than 450,000 successful treatments worldwide, and currently has a less than 1 percent re-treatment rate. The clinic offers a variety of treatment options suitable for all cases. In addition, take-home products are available for at-home treatment, preventative care, after treatment care, and more. The highly-trained technicians are available seven days a week, by appointment only, but will work with each family to offer same-day appointments. They begin by screening each family member and then discuss possible treatment needs. The staff works with each family to find the treatment that is most affordable and effective for their situation. The clinic is so confident in their signature package, they offer a 30-day lice-free guarantee. In less than two hours, people will leave the clinic lice-free and stress-free. The clinic currently serves Kitchener, Cambridge, Guelph, Waterloo and surrounding areas. And a new clinic will be opening in Oakville in May 2019. For more information on Lice Clinics of Canada, check out their website at www.liceclinicsofcanada.ca.